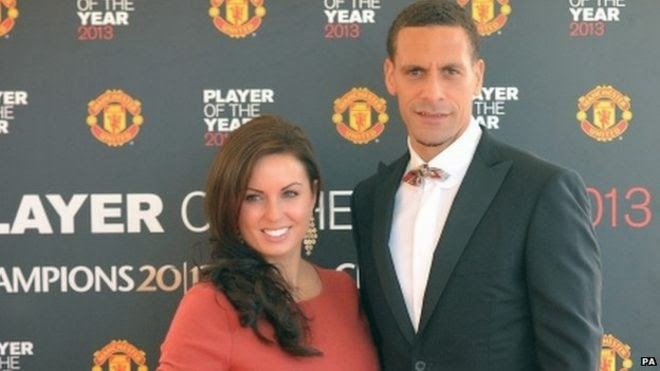 This news is so sad because I remember while I was still in the UK, reading about English footballer Rio Ferdinand in the papers falling in love with Rebecca Ellison. I was dating Atala long distance at the time, and as it turned out, they got married the same year as we did. So imagine my shock when I read the news today that Rebecca Ferdinand died in a hospital in London following a short battle with cancer. Rio Ferdinand's announcement of the sad news is terribly heartbreaking. 'My soul mate slipped away last night. Rebecca, my wonderful wife, passed away peacefully after a short battle with cancer at the Royal Marsden Hospital in London. She was a fantastic loving mother to our three beautiful children. She will be missed as a wife, sister, aunt, daughter and granddaughter. She will live on in our memory, as a guide and inspiration. 'Myself, my parents Janice and Julian, along with Rebecca's parents Lesley and Stephen, would like to thank our families, friends and my club colleagues who have rallied around in these desperate days, weeks and months. I would also like to express my gratitude for the dedication and expertise of the staff led by Professors Johnstone and Clarke at the Royal Marsden. Their valiant efforts to prolong Rebecca's all-too-short life will not be forgotten. I wish God to console him, their three children and their entire family. And may God rest her soul. Amen.